Here is a handsome profile of a young male bottlenose dolphin (Tursiops truncatus). The bottom jaw of this species extends out past the upper jaw, however in this animal it is even more pronounced than in most individuals. Here he is again. You can see the lower jaw even better. His father's lower jaw extends out just like this. It's an individual genetic trait inherited from his father. Trainers and scientists often use such traits to help tell one individual animal from another. 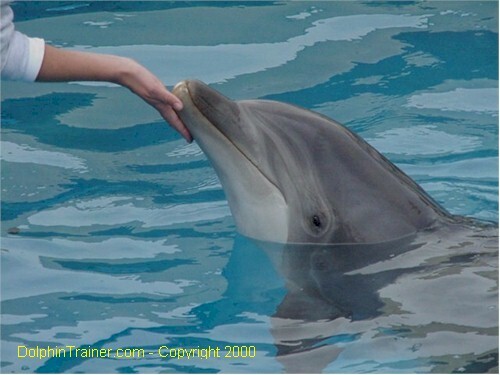 Here is a very sweet female bottlenose dolphin getting an affectionate chin rub from her trainer. She is over 40 years old and going strong! This is a remarkable age for any dolphin, either in the wild or in human care. 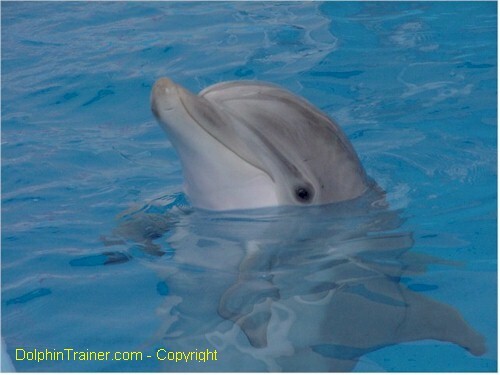 We liked this photo so much we used it to make our original DolphinTrainer.com logo. We think it's a nice way of honoring a great animal and the people who have taken such wonderful care of her over the years. 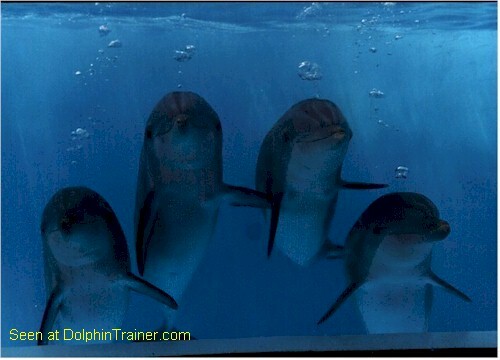 These four dolphins are blowing bubbles from the blowholes located on the tops of their heads. These guys may look familiar as well. This photo was used to make the Title Banner at the top of each page on our website. Here is a shot of a mother dolphin and her new born baby. Young calves stay very close to their mothers. As the mother moves through the water the calf is actually pulled along in the mother's "slip stream". This helps the baby so it doesn't have to work so hard to keep up with mom and the other dolphins. This calf is quite a bit older and larger than the one above. Calves grow rapidly on mother's milk which is very concentrated and high in fat content. 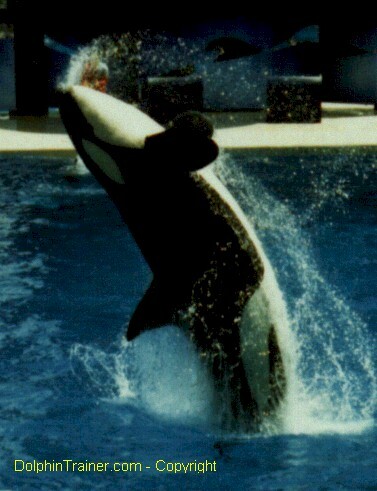 In this photo, the mother's milk swollen mammary glands are visible just above the tip of the calf's dorsal fin. After several weeks the calves begin to exercise more and more independence. Like the adults, they are very curious and, over time , begin to interact with the trainers and staff through the windows. 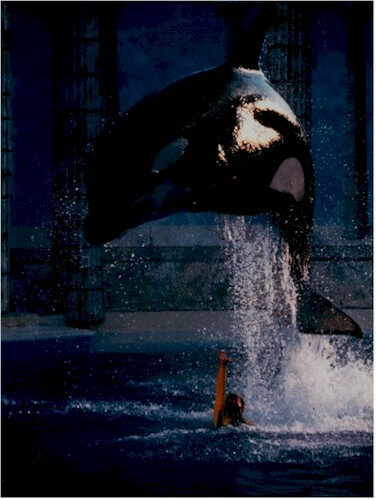 Killer whales (Orcinus orca) are actually the largest members of the dolphin family, Delphinidae. They are incredibly powerful and agile animals. 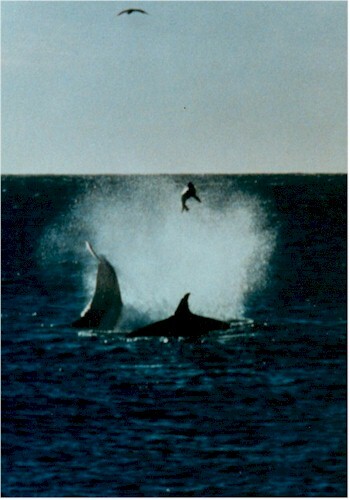 This one is leaping out of the water performing a "back dive" behavior. Trainer's spend a great deal of their time interacting with and developing strong relationships with all of their animals. Spectacular behaviors likes this are the result of these mutually respectful and trusting relationships. Killer whales get their name and awesome reputation from their natural position as the oceans' top predator. For more information on this fascinating subject check out our feature article "A Killer Reputation". Beluga whales (Delphinapterus leucas) are not dolphins. They are in the same family as narwhals, the family Monodontidae. Some people call them "white whales" due to their obvious color. Some sailors used to call them "sea canaries" due to their high-pitched underwater vocalizations. This cute little guy is a finless porpoise (Neophocaena phocaenoides). 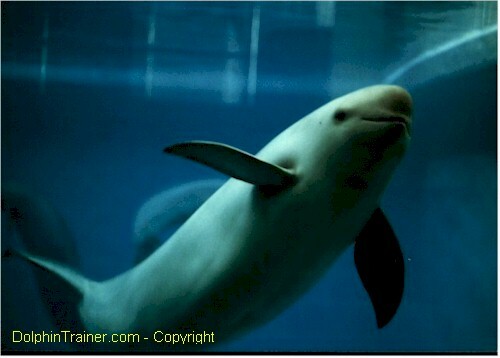 There are about six different species of porpoises in the family, Phocoenidae. 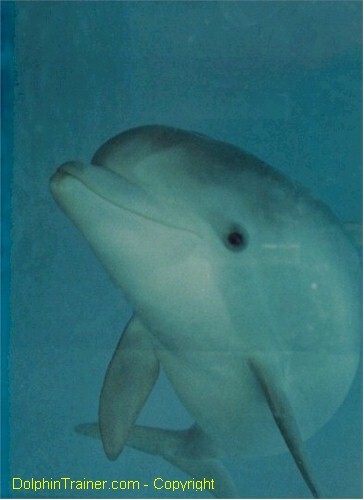 Porpoises differ from dolphins in several ways. One way is their teeth. 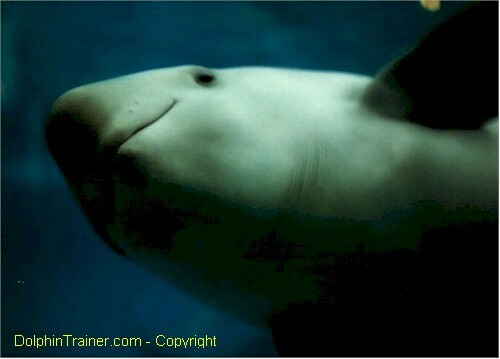 Most porpoises have flat triangular teeth. Dolphins have conical shaped teeth. 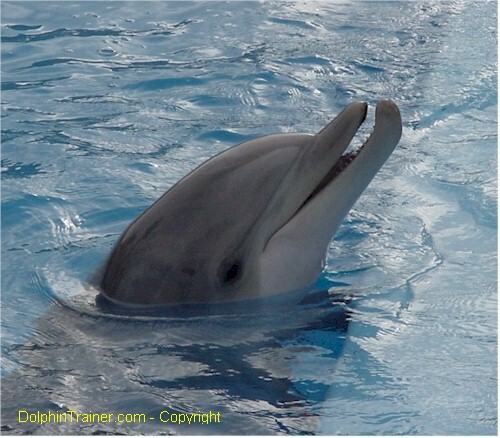 Most dolphins have curved dorsal fins. Most porpoises have triangular shaped dorsal fins. This particular species has no dorsal fins, hence the name finless porpoise. For more information about cetaceans, check out our Facts & Information section.